Spare Parts Plus! (no ads) - allows you to enable and change some hidden settings of your Android device. This app is based on the open code provided by Google but updated to work with Android 2.33 GingerBread and tested on CyanogenMod7. This app is provided to you for free and without AdMob ads. Note that stock GingerBread ROMs do not have the Battery History activity. You need CM7 or Custom Rom to see this. I am working on a fix for a future version. 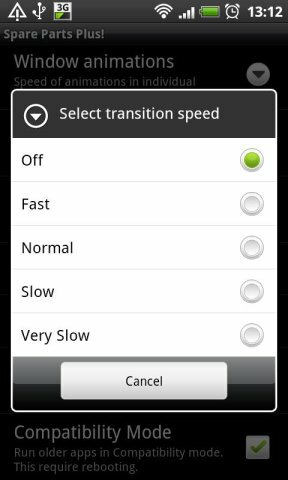 - Control windows animation speeds or disable them entirely to speed up your device! 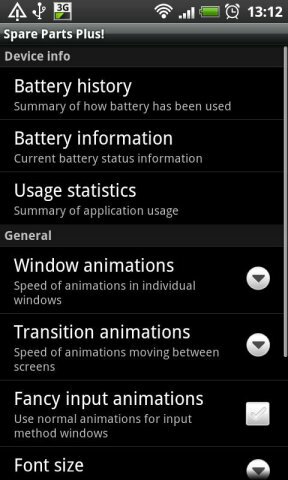 - Control windows transition speeds or disable them entirely to speed up your device! This is the first release and more features and settings will be added soon. Look out also for our Blade Buddy program for rooted devices which allows you to change, optimize and speed up your phone even more! Warning: some ROMs do not have battery history activity built-in. The app will force close if you try to run and this activity is not built into the ROM. These are required to change your settings and also to enable analytics and bug-tracking.